Live Today signals a new journey for bassist and composer Derrick Hodge as he embarks on a solo recording career. The title alludes to his top guiding principle in creating his 2013 debut album, a stunning achievement that showcases the profound depth and breadth of his musicality. Even though Hodge has played with such jazz titans as pianist Mulgrew Miller and trumpeter (and labelmate) Terence Blanchard, as well as R&B stars Jill Scott and Maxwell, the 33-year-old bassist is probably best known for anchoring the Grammy award-winning Robert Glasper Experiment. Similar to how Glasper concocts a distinctive m‚lange of modern jazz, hip-hop, and R&B, Live Today too integrates those genres and more into something that's potent and personal. Bassist, composer and producer Derrick Hodge has spent much of his life absorbing, studying, and playing music: from gospel and classical to hip-hop, Philly-and-neo soul; from post-bop and modern jazz, to cinema music. Live Today, his debut for Blue Note, reflects the sum total of his professional experience – working with Mulgrew Miller, Terrence Blanchard, Stefon Harris, Common, Jill Scott, Q-Tip, Maxwell, and the Robert Glasper Experiment, composing film scores, etc. – that has resulted in a rarified musical vision. Hodge's self-produced album is a sprawling, hour-long set, that displays a mercurial, adventurous aesthetic, which is as disciplined as it is fluid and welcoming. Live Today is polished, not slick; it frames and colors a music that is purposely raw and kinetic – most of the album was composed just weeks before recording – and preserves moments of unplanned inspiration. Opener "The Real," embodies almost everything at once. Commencing with samples, loose percussion, and tight kit work from Chris Dave, a vampish melody from keyboardist James Poyser emerges and gradually invites the horn section (Keyon Harrold, trumpet; Marcus Strickland, tenor saxophone; Corey King, trombone), turntables, synths, and Hodge playing electric and acoustic basses. It's a groover; equal parts contemporary and post-bop jazz, and funky neo-soul. 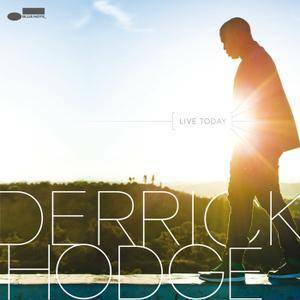 On "Message of Hope," Hodge plays a nearly hummable melody in the upper register of his electric, accompanied by drummer Mark Colenburg and Travis Sayles on keyboards. The bass solo builds on the repetitive vamp frenetically, becoming an encounter with jazz-rock. Common rhymes breezily and soulfully on the jazzy hip-hop of the title track, with Glasper's instantly recognizable pianos (acoustic and Rhodes), and Dave's rolling, in-the-pocket restrained snare and hi hat. Hodge moves underneath, pushing at the tune's edges until it expands. "Dances with Ancestors" is a nocturnal ballad with numerous interlocking parts from various keyboards, killer breakbeats, a post-bop horn chart, and Hodge's bass interludes tying it together. "Anthem in 7" is a syncopated, dazzling, bass-driven groover that embodies dubstep, contemporary jazz, and neo-soul. "Holding On to You," a nearly straight-ahead folk-pop number, features vocalist/guitarist Alan Hampton, and is adorned only by the leader's upright bass and his arrangement for the American String Quartet. They also appear on on the haunting "Solitude," with pianist Aaron Parks on top, and Dave keeping slippery time; Hodge solos around the entire frame, almost like a singing voice. On the public domain Christian hymn, "Doxology (I Remember)," the bassist bows his upright on the melody, accompanied by Sayles' B-3 sounding like church organ. Closer "Night Vision," on which Hodge plays all instruments, is the last of several interludes interspersed throughout the set, denoting the album's various sections. For all its exploration and diversity, Live Today would be a cipher, were it not for Hodge's intense focus that reins the entire sprawling encounter, into a provocative, utterly engaging whole.